Prostatic stromal tumors of uncertain malignant potential (STUMPs) generally arise in older men who usually present with obstructive urinary symptoms. 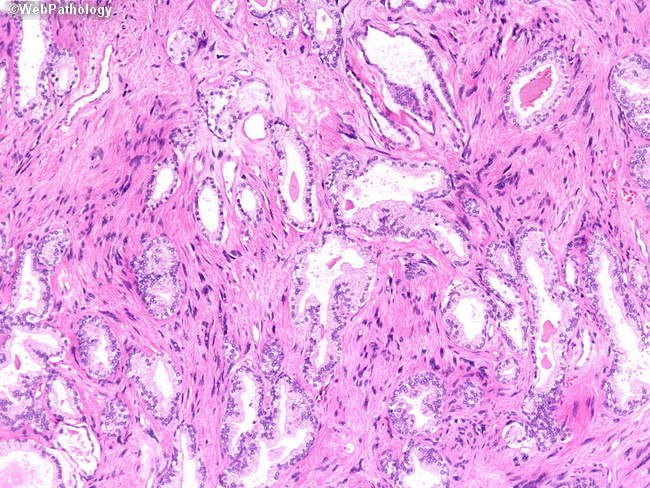 The most common histologic pattern (approx. 50% of cases) consists of highly pleomorphic cells with degenerative type atypia scattered among benign prostatic glands. Other patterns include phyllodes tumor-like growth, hypercellular stroma without atypical cells, and myxoid stroma.